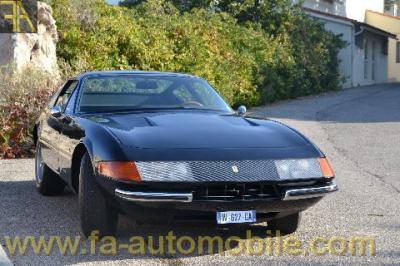 Ferrari 365 GTB/4 Daytona Serie 1 finished in Nero over Beige hide trim. This example has to be one of the most original and well preserved Daytonas in existance. Absolutely untouched since it left the factory over 40 years ago. European specs car, 100% matching numbers, Ferrari maintenance, all books, all tools and Ferrari Classiche certification. Just serviced. Available immediately for inspection. Sister car pictures. Please enquire for a full dossier.